Description: Tripp Lite's EMS1250UL inverter with integrated charging system provides automatic, uninterruptible DC-to-AC power for critical on-board equipment. Ideal for installation by ambulance/EMS vehicle manufacturers, dealer or EMS service for OEM, replacements and upgrades. Supplies up to 1250 watts of continuous 120V AC power to 2 AC outlets from any 12V battery or automotive DC source. 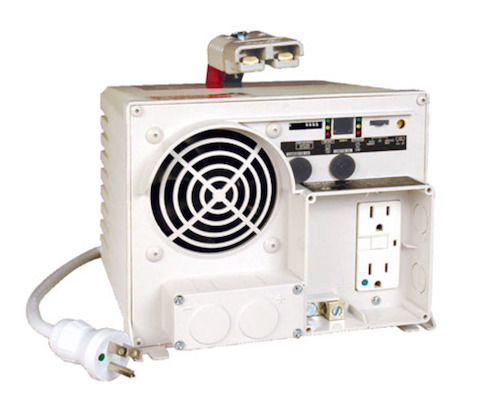 When AC cable is connected to a shore power source, commercial power passes through to connected equipment and the battery set is recharged via 3 stage, 14/55 amp selectable charging system. This unit can also function as a UPS system, responding to blackouts and voltage fluctuations with a near instantaneous automatic transfer to battery-derived AC output. Convenient Anderson DC input quick connector on the unit with extra Anderson DC input connector included in the box (user supplies batteries and cabling). Reliable large transformer design with efficient PWM sine wave output and frequency control powers resistive electronic loads or large inductive motors, compressors and other items with high current needs on startup. Included APSRM4 wired remote power switch with full status LEDs provides remote power inverter on/off switching and continuous status information (APSRM4 included). Supports an unlimited amount of runtime with any number of user-supplied batteries connected. Highly adaptable to a variety of applications and site conditions with adjustable charger settings for wet/gel battery types and selectable line to battery power transfer voltages. Includes AC input surge suppression. Includes hospital grade plug and outlets with GFI (ground fault interrupter) protection. TUV tested to UL458 (mobile inverter) and CAN/CSA-C22.2 No. 107.1-01. 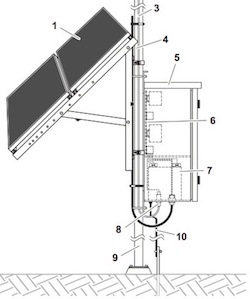 Meets GSA ambulance specification KKK-A-1822.